The upcoming apartments at The Lilium (formerly the How Sun Park condos) are soon to open its show suites. A project that promises to provide state of the art facilities and quality living conditions to its future residents, The Lilium is brought to us by developers Singhaiyi Huajiang Amber Pte Ltd of The SingHaiyi Group Ltd. The 5-storey condominiums which have a freehold tenure are designed to house 80 apartments in two-blocks. The apartment will range from 1 to 4-bedroom units as well as penthouses on completion. The layout of the site has been meticulously planned and designed to ensure overall comfort and beauty for ideal living in the city. An investment in The Lilium promises to be a smart long term decision if you are looking to buy a new home. The expected vacant possession of the development is slated in mid-2022. Each apartment will be fitted with up-to-date kitchen appliances and sanitary wares from reputed companies like Electrolux, Grohe, Laufen and Samsung. Each block will have two lifts for the convenience of residents as well as their guests. Located in a quiet private landed enclave in district 19, The Lilium blends the experiences of modern living with small community charm. At 31 and 33 How Sun Road, the freehold development promises the future residents a serene and peaceful ambiance while at the same time remain within easy commuting reach of several facilities making it a smart choice for young and mature potential investors alike. Besides the small community charm that many residents have grown to love, The Lilium is nearby to well-loved malls such as Heartland Mall and Hougang Mall and minutes walk to Bartley MRT Station. Within a kilometre is both Paya Lebar Methodist Girl’s Primary school and Maris Stella Primary school. 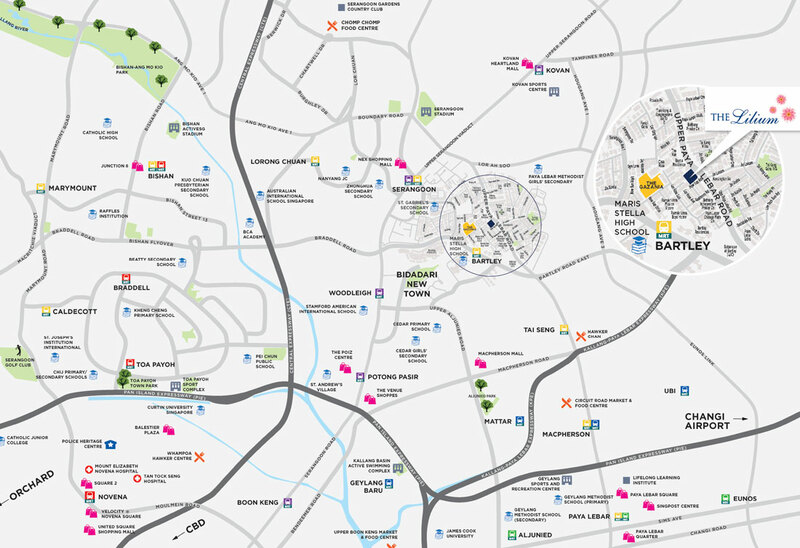 Ease of Commuting: The development itself is merely a short 5 minutes walk away to Bartley MRT station. The Bartley station runs along The Circle Line and residents are seamlessly linked to the Downtown Line, North-South Line, North East-Line and future Thomson East-Coast Line via the Circle Line. Bidadari New Town: Located near The Lilium, the upcoming Bidadari New Town which is projected to be completed by 2030 also promises several amenities that will be easily accessible to the residents of The Lilium. Besides a mixed development with a mall that will provide new avenues to shop, dine and open business opportunities in, the Bidari New Ton Project will also provide residents of The Lilium a tranquil retreat in the form of several landscaped parks and gardens. Paya Lebar Quarter: The progressive business hub of Paya Lebar Quarter is also within a stone’s throw from the Lilium. The quarter promises to provide an eco-friendly space for rentals and business besides providing residents with more choices for a relaxing shopping and dining experience. The SingHaiyi Group Ltd, Singapore which took over the project of the apartments at The Lilium has built itself a reputation of being a fast-growing real estate firm. The group has created a name for itself with stellar residential property development and has sold all units of its most recent projects including The Vales EC, CityLife Tampines EC, and Pasir Ris One DBSS. Besides developing residential property The SingHaiyi Group Ltd also has extensive experience in the field of investment and management services. The Group is making its mark not only in Singapore but in Malasia and the USA as well. The SingHaiyi Group Ltd is committed to delivering quality and state of the art projects. Prices are subject to availability of units and changes by Developer, please contact us at +65 6100 4668 for the latest updated price guide. 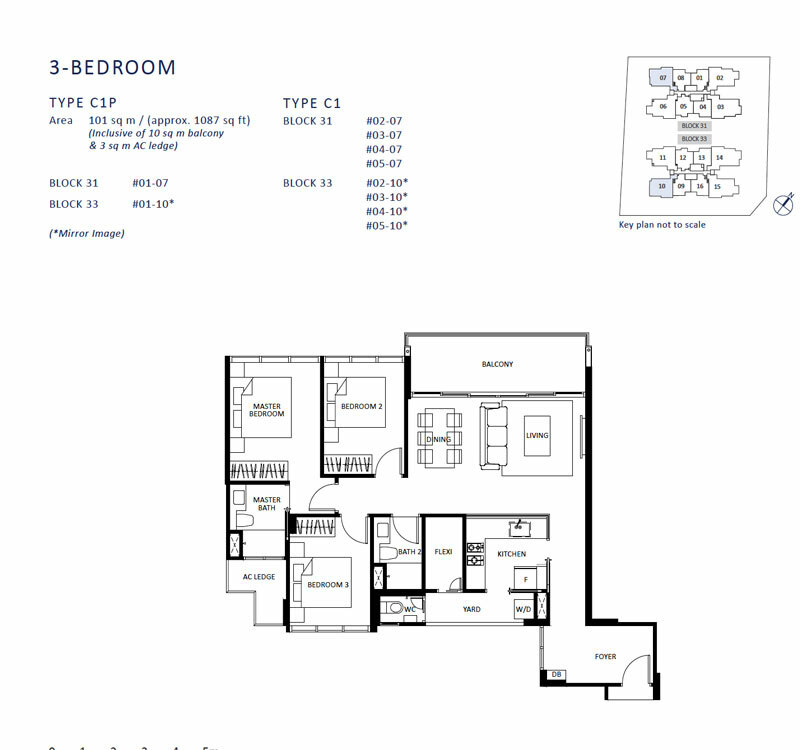 Please contact us for full range for floor plans.